Scott Patterson and Denali Strabel ruled the 26th annual Lost Lake Run, which delivered a strong field, a muddy trail and a sunny postrace party Saturday. An overnight downpour made for sloppy conditions. 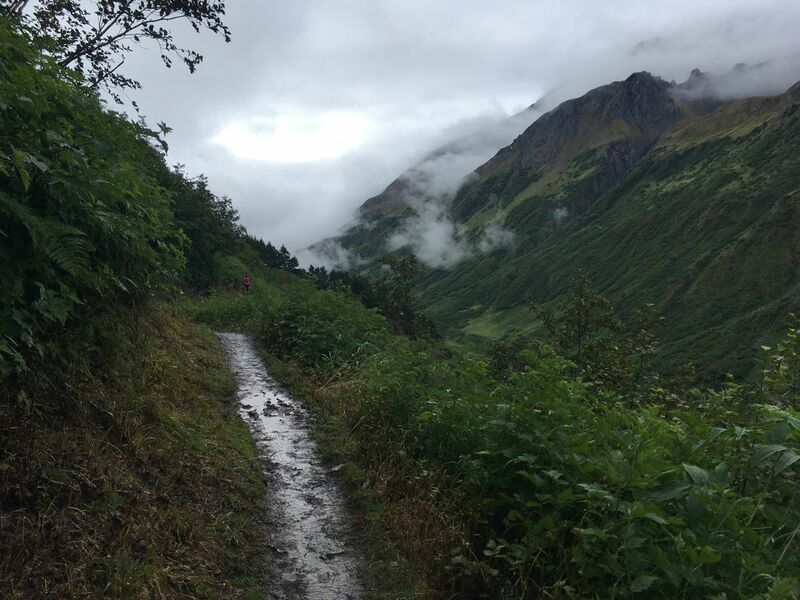 The 15.75-mile run, held on a service trail in the Chugach National Forest, goes from the Primrose Campground to the Bear Creek Fire Department near Seward. "It was a mudfest," Strabel said. "I feel like it was worse at Primrose because all the boys were kicking up mud." The race includes 2,100 feet of climbing, and Strabel was one of 22 people — and two women — to finish in less than two hours. She clocked 1:58:27 for a 90-second win over runner-up Najeeby Quinn (1:59:56). "It was a battle out there," she said. Two of Alaska's top mountain runners, Strabel and Quinn were well off Chris Clark's record time of 1:49:15 set in 1999, the summer before Clark represented the United States in the women's marathon at the 2000 Summer Olympics. Patterson, who won Mount Marathon in July, used his uphill prowess to build a gap on second-place Chad Trammell, who won the recent TransRockies stage race in Colorado, and third-place Jacob Kirk, who placed 105th overall at this year's Boston Marathon. Patterson, a contender to make the 2018 Winter Olympics ski team, defended his title in 1:37:30. He was more than two minutes off the record of 1:35:16 set by Jerry Ross in 2011 but was more than two minutes ahead of Trammell (1:40:07) and nearly three minutes ahead of Kirk (1:40:25). "I know I'm strong on the uphill so I worked that as hard as I could, and hoped these guys wouldn't cut me on the way down," Patterson said. One of Alaska's most popular trail runs, the Lost Lake Run is a fundraiser for cystic fibrosis. 1. Scott Patterson 1:37:30 2. Chad Trammell 1:40:07 3. Jacob Kirk 1:40:25 4. Matthew Adams 1:41:01 5. Ryan Beckett 1:44:21 6. Russell Johanson 1:45:00 7. Matias Saari 1:45:27 8. Eric Strabel 1:45:51 9. Brent Knight 1:46:25 10. Erik Johnson 1:47:05 11. Corbyn Jahn 1:51:12 12. Adam Reimer 1:53:01 13. Ryan Cox 1:53:39 14. Willie Stoll 1:55:15 15. Jeff Young 1:55:55 16. Lee McAuliffe 1:56:23 17. Isaac Bertschi 1:58:18 18. Sam Severin 1:58:21 19. Jason Lamoreaux 1:58:30 20. Denver Waclawski 1:59:05 21. Gino Graziano 2:01:19 22. Miles Knotek 2:03:15 23. Conor Deal 2:03:26 24. Joe Thomas 2:03:31 25. jack consenstein 2:05:04 26. Joshua Allely 2:05:14 27. Brandon Rinner 2:07:11 28. Martin Miller 2:07:43 29. Martin Schuster 2:08:19 30. Zachary Hedling 2:08:46 31. andrew stavich 2:09:53 32. Michael Bourdukofsky 2:10:15 33. Noah Robertson 2:10:26 34. Greg Scofield 2:10:31 35. Karl Romig 2:11:38 36. Mike Heatwole 2:11:58 37. Josh Dean 2:12:21 38. wes hoskins 2:12:24 39. Brian Haviland 2:12:34 40. Ryan Fisher 2:12:47 41. Gavin Dixon 2:12:51 42. Brian Menghini 2:13:21 43. Jesse Foster 2:14:37 44. Caleb Rauch 2:17:36 45. Josh Morales 2:17:47 46. Benjamin McGarry 2:18:33 47. Bill Wood 2:20:01 48. Gabriel Juliussen 2:20:06 49. Philip Brock 2:20:11 50. Randy Williams 2:20:13 51. Craig Gulledge 2:20:55 52. Kyle Cheesbrough 2:21:24 53. Tully LaBelle-Hamer 2:21:34 54. Peter Clemens 2:22:03 55. Andy Varner 2:23:18 56. Brian Waite 2:23:24 57. Ward Van Sickle 2:23:28 58. Paul Ostrander 2:23:28 59. Kenny Daher 2:23:42 60. Tony Eskelin 2:23:42 61. Jeff Jessen 2:23:46 62. Ch Walker 2:23:46 63. Matti Silta 2:24:08 64. John Heimerl 2:24:30 65. Eric R. Pickett 2:24:48 66. Marty Byrne 2:25:31 67. Jeremy Weaver 2:25:32 68. Neil McMahon 2:25:32 69. Luke Thies 2:25:43 70. Rick Hanson 2:26:42 71. Casey Cheesbrough 2:28:42 72. Rocky Elhard 2:28:42 73. William Mcdermott 2:28:52 74. Matt Waliszek 2:28:52 75. Joe Jolley 2:29:33 76. Barry Benko 2:30:35 77. Steve Gilles 2:30:37 78. Jeff McDonald 2:30:38 79. Bob Heinrich 2:31:02 80. Jared Gardner 2:31:12 81. Lael Gordon 2:31:30 82. David Popiel 2:32:11 83. Todd Henry 2:32:47 84. Brendan McKee 2:33:07 85. Adam Rothman 2:33:30 86. An Dennis 2:34:03 87. Marcus Reese 2:34:16 88. Ben Armentrout 2:34:50 89. Scott Huff 2:35:09 90. Matt Eley 2:35:35 91. George Crowley 2:36:33 92. Sean Zumwalt 2:36:55 93. Todd Parrish 2:38:00 94. Jared Kern 2:38:06 95. Ryan Gallagher 2:38:47 96. Justin Ennis 2:39:01 97. Derek Bynagle 2:39:16 98. Marek Kolendo 2:39:19 99. Flip Foldager 2:39:33 100. Steve Noble 2:39:44 101. Zachary Gibson 2:39:50 102. Thomas Collins 2:40:56 103. Kameron Perez-Verdia 2:41:05 104. Elijah Williams 2:41:08 105. Jeff Sires 2:41:15 106. Jake Gray 2:41:16 107. Miles Jorgensen 2:41:51 108. Ed Leonetti 2:42:03 109. Michael Schmidt 2:42:33 110. Karl Bruening 2:43:12 111. Michael Craytor 2:43:21 112. Brent Williams 2:43:29 113. Scott Paradis 2:43:45 114. William Miller 2:44:03 115. Larry Harmon 2:44:04 116. kevin lauver 2:44:54 117. Mark Menghini 2:44:55 118. Patrick Metzger 2:45:13 119. Nelson Alger 2:46:11 120. Joshua Love 2:47:29 121. Trevor Worrell 2:47:38 122. Bruce Talbot 2:47:50 123. Corey Madden 2:48:02 124. Dean Denter 2:48:14 125. Christopher Barnett 2:48:28 126. Brant Grifka 2:49:28 127. Duke Ruzicka 2:50:19 128. Mark Miller 2:50:25 129. Clinton Carpenter 2:50:31 130. Ty Ketchum 2:50:36 131. Brad Dunker 2:51:06 132. Aaron Christie 2:51:09 133. Lon Embley 2:51:21 134. Eric Klein 2:51:46 135. Rhyss Vivian 2:51:57 136. Lee Frey 2:52:35 137. Jason Buckbee 2:52:39 138. Garth Bruce 2:53:16 139. Tom Deakins 2:53:19 140. Jon Iannaccone 2:55:09 141. Jeremy Jaminet 2:55:36 142. Mark Jacobsen 2:55:39 143. Chris Penn 2:55:44 144. Tab Ballantine 2:55:59 145. Brenden Turney 2:57:56 146. Brice Alexander 2:58:15 147. Joel Kiekintveld 2:59:07 148. Johnny Hedges 2:59:10 149. Matthew Stielstra 2:59:14 150. Chad Smith 2:59:50 151. Chad Arthur 3:00:59 152. Daniel Hall 3:02:22 153. Edward Wickham 3:02:34 154. Keith Brown 3:03:22 155. Be Richardson 3:03:36 156. Fred Moore 3:04:16 157. Michael Besh 3:06:12 158. Trevor Davis 3:06:42 159. Ronn Laurin 3:07:56 160. Daniel Morton 3:08:09 161. Doug Bishop 3:08:13 162. Jeff Barber 3:08:43 163. Dennis Sorenson 3:08:58 164. Steve Teeter 3:09:04 165. Scott Jordan 3:10:11 166. Brad Garland 3:11:35 167. Jason Bressler 3:13:21 168. Howard Levine 3:13:35 169. Rodney Thompson 3:14:19 170. Ben Hanson 3:17:17 171. Gary Wang 3:17:28 172. Paul Adkins 3:18:09 173. Patrick Robinson 3:18:59 174. Mike Jipping 3:19:00 175. Nathan Burke 3:19:10 176. Joe Ruble 3:20:37 177. Joshua Parker 3:20:40 178. Michael Huckabay 3:20:49 179. Roy Longacre 3:21:27 180. Jason Hemphill 3:21:34 181. Michael Evans 3:22:50 182. Gerry Van Kooten 3:22:59 183. Daniel Suver 3:23:10 184. Jeff Perschbacher 3:23:29 185. Joel Cusick 3:23:41 186. Lucas Nelson 3:25:06 187. Brian Worthington 3:26:14 188. George Forman 3:26:18 189. Dan Weathers 3:26:46 190. Dan Maclean 3:26:58 191. Andrew Mitton 3:27:25 192. Sean Lamb 3:27:54 193. Adam Walker 3:28:23 194. Jim Hoppenworth 3:28:49 195. James Steward 3:28:52 196. Brendon Bruns 3:28:53 197. Justin Prasil 3:28:54 198. Bryan Frapp 3:36:47 199. John Ferguson 3:36:49 200. Brent Veltkamp 3:36:50 201. Mark Moorhead 3:39:49 202. Derek Barickman 3:45:02 203. Niles Woods 3:45:15 204. Dennis Poirier 3:46:08 205. Kelly Nichols 3:47:19 206. Neil Lamothe 3:47:25 207. Chad Jensen 3:47:35 208. Lance Allen 3:50:08 209. Charles Utermohle 3:54:26 210. William Taff 3:55:00 211. Steve Agee 3:59:10 212. Martin Cassens 3:59:19 213. Richard Luff 3:59:43 214. Larry DeBoard 4:00:33 215. Steve McKeever 4:00:43 216. Matthew Dixon 4:02:14 217. Jacob Masneri 4:02:14 218. Chad Garner 4:03:07 219. Steve Haynes 4:03:31 220. Reuben Seidl 4:03:58 221. Jeff Brace 4:07:38 222. Robert Bingman 4:09:00 223. Adam Hollon 4:10:34 224. Mike Sulava 4:12:56 225. Chase Swalling 4:14:02 226. Rob Kurtz 4:14:47 227. Tucker McGownd 4:15:24 228. Glen Anderson 4:16:41 229. Brian Braeutigam 4:16:47 230. Doug Hogue 4:18:34 231. Dylan Hogue 4:18:34 232. jeffrey bryden 4:19:13 233. Steve Williams 4:20:17 234. Clark Clingenpeel 4:20:54 235. Jeremy Beheler 4:21:01 236. Brian Flynn 4:24:17 237. luke peroni 4:31:57 238. Max Folk 4:34:52 239. william newcombe 4:39:46 240. Joel Lawrence 4:40:03 241. Peter Laliberte 4:45:12 242. Gabe Kompkoff 4:45:16 243. Brian Tureman 4:50:18 244. Craig Humphreys 4:50:19 245. Frank Alioto 4:53:22 246. Marco Zaccaro 4:53:26 247. Marc June 4:57:10 248. Larry Levine 4:57:12 249. Mark Kemberling 4:59:08 250. joel varner 5:00:13 251. Shad Schoppert 5:04:32 252. Rich Hull 5:07:45 253. Jason Swift 5:33:15 254. Gordy Heinen 5:43:11 255. Luis Gerard Ochoa 5:52:41 256. Craig Hinkle 6:14:58 257. Bronson Frye 6:15:47 258. James McEahern 6:22:32 259. Jordan Teel 6:31:59 260. Alex Slivka 6:43:38 261. Jonathan Hartford 6:55:39 262. Robert Hunt 6:57:08. Alaska Dispatch News columnist Alli Harvey contributed to this report.